College of Architecture master student Joshua Puppe has received numerous accolades from Autodesk’s Rookies program, the first being four “Excellence Awards" in the "Architectural Visualization" competition category for the Rookies 2018 Awards. 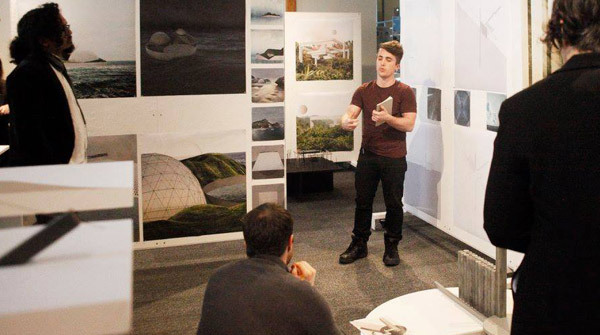 The Rookies program offers budding architectural designers and creatives a platform to showcase their work with top-rated industry professionals where it is graded and critiqued. Entrants have the potential to earn awards, educational scholarships and even studio internships. Several of Puppe’s projects with the Excellence Award designation are currently featured as "Editor's Pics." The “Editor’s Pics” badge is awarded to entrant pages and projects that are of the absolute highest quality. Puppe’s submissions are a curated collection of work from his last two master design studios taught by UNL Hyde Chair Lecturers Nathalie Frankowski and Cruz Garcia and other miscellaneous work. In addition to earning four “Excellence Awards”, Puppe is a Rookies 2018 Awards competition finalist. Annually, thousands of entrants from around the world compete but the Rookies only selects five winners. Puppe is also a finalist for two Rookie scholarships: Vancouver Film School full scholarship and the Think Tank Centre scholarship. Winners for both the Rookies 2018 Awards and the scholarships will be announced July 16th. “I’m profoundly proud of the talent, rigor and drive our students possess, and it’s an amazing honor to have our students recognized internationally for their outstanding achievements,” said College of Architecture Dean Katherine Ankerson.